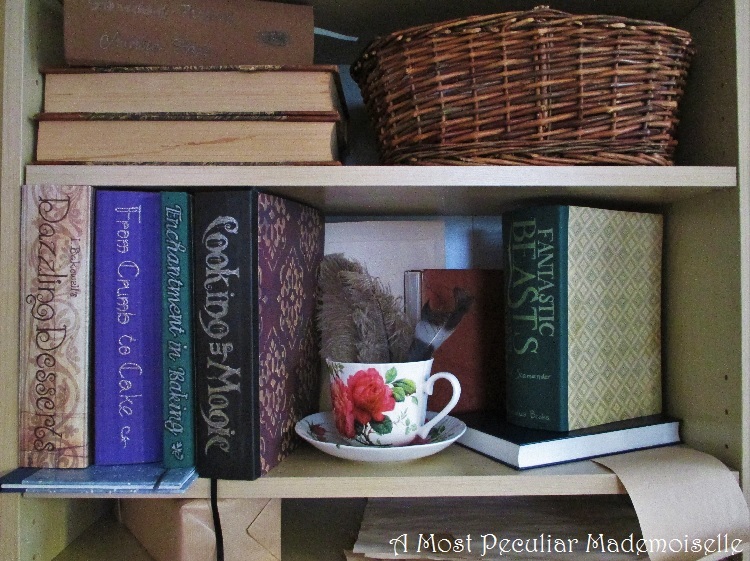 This year I have been looking at ways to make our home wizardy for the party without having to remove too much of the Muggle things. 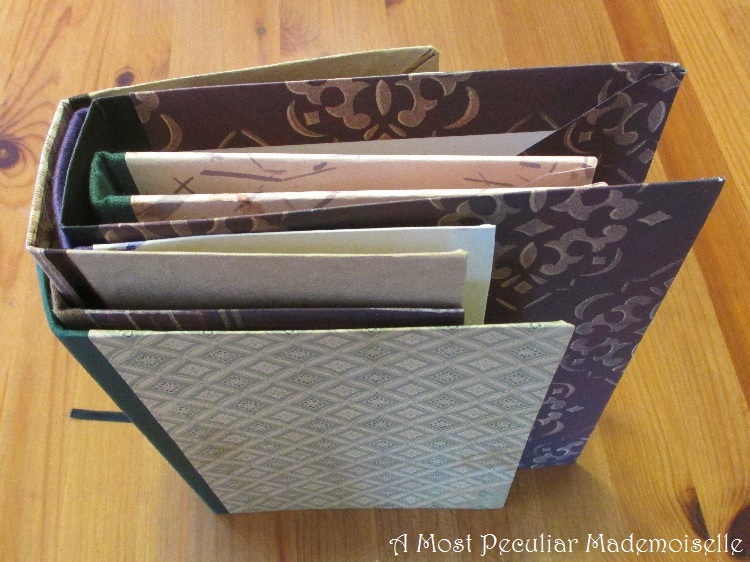 The row of faux book spines is one example of this, but I made these faux book covers before them, but fore some reason didn’t get round to blogging about them until now. They are mostly made from old cartons that originally contained pasta, corn flakes and the like, using scrapbooking paper and in some cases fabric to cover them. 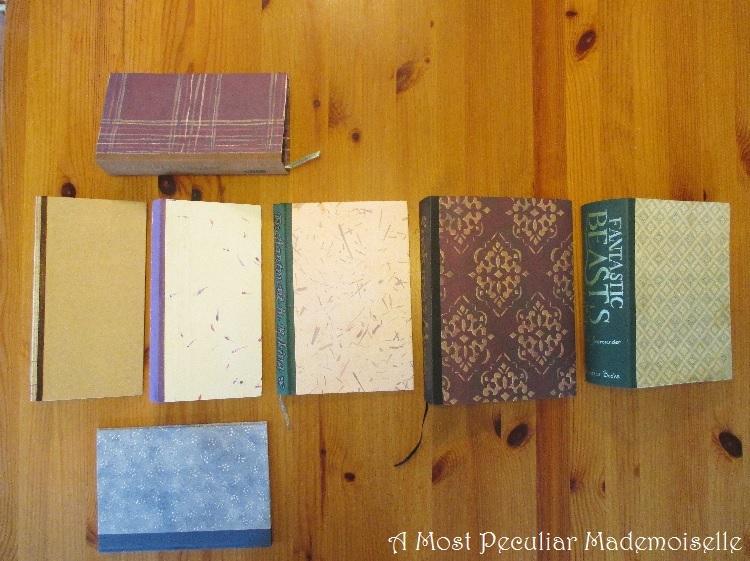 A few are made over from old book covers – that’s where I started out and went over to empty cartons once I didn’t have any more rubbish books (yes, they really were rubbish) to use. 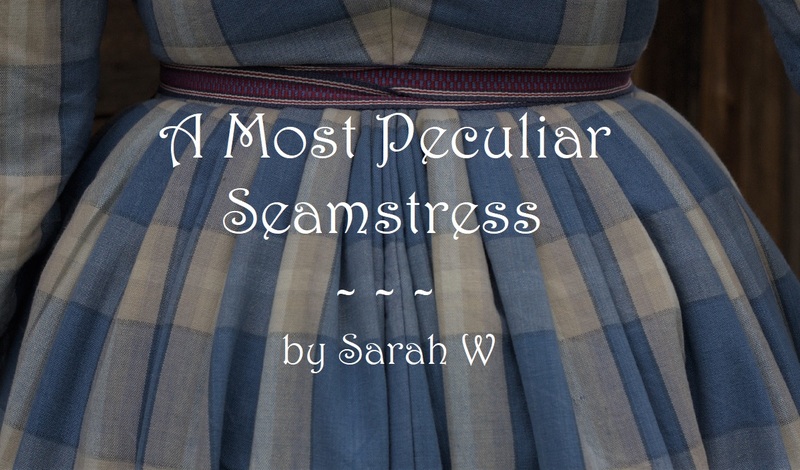 For some of the titles I copied straight from the Harry Potter books (like Enchantment in Baking and Fantastic Beasts and Where to Find Them), and for the rest (Dazzling Deserts by I. Bakewell, Cooking up Magic, and Household Potions by Aurelia Haze) I made the titles up myself. It looks more real and believable if you have a mix of things you know from the books and things that aren’t mentioned there, but fit in with the culture. From Crumb to Cake has the title embroidered in imitation silver thread, but the rest are written with pen, paint or even stamped on – that was before I had confidence enough to trust to my own writing skills. 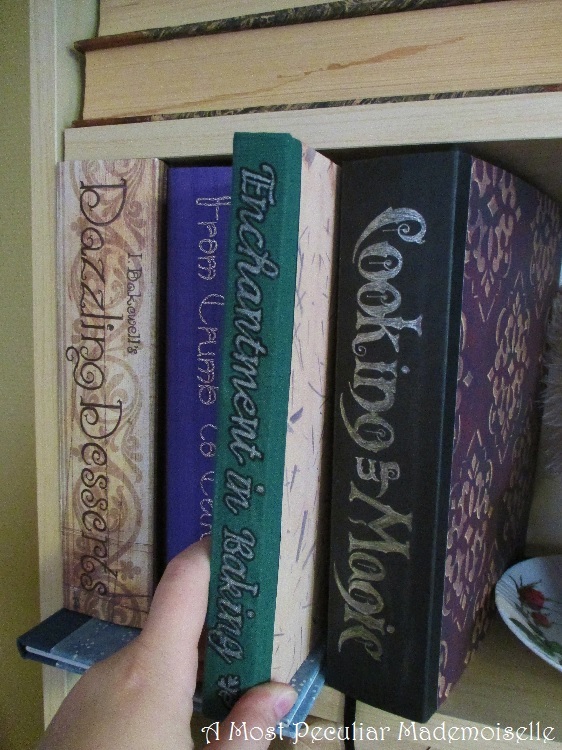 These books are made to look good even when seen from the side, and they are a great way to hide my Muggle cookbooks; just put a faux cover around one or several cookbooks and they’re hidden with very little effort. 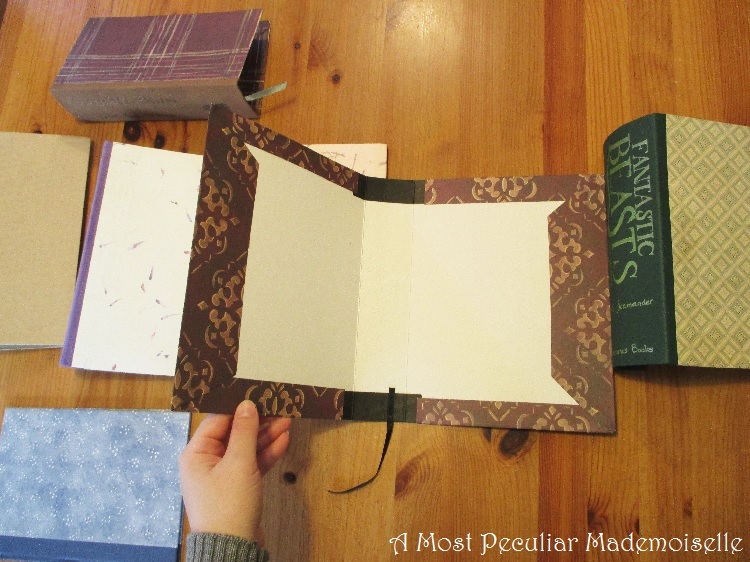 Fantastic Beasts only have a proper cover on one side though – it’s made more in the fashion of the faux book spines mentioned above, and the side that does not have a cover has holes punched in it, so it can be attached to the row of faux book spines but still look good from the side, if I want to put them in a more open place in future. They also store easily, fitting nicely one inside another. Again I styled the shelves for the pictures, and everything might be arranged a bit differently at the actual party. Pictures of that will come after Halloween. Any of you working on Halloween stuff yet, and if so, what are you making?